A part of the tax-incentive enterprise zone, the Corvallis Airport Industrial Park is located near the Corvallis Municipal Airport on Highway 99W, 3.5 miles south of downtown Corvallis and four miles from Oregon State University. Zoned for airport and industrial activities, the park has attracted nearly 20 high technology, light manufacturing, and services businesses. The 220-acre park is connected to city water and sewer, as well as electricity, natural gas and telephone services. It is also easily accessible by rail, highway and air. It is 15 miles from the Airport to Interstate 5, traveling Highway 99W north, and then turning east on Hwy 34. 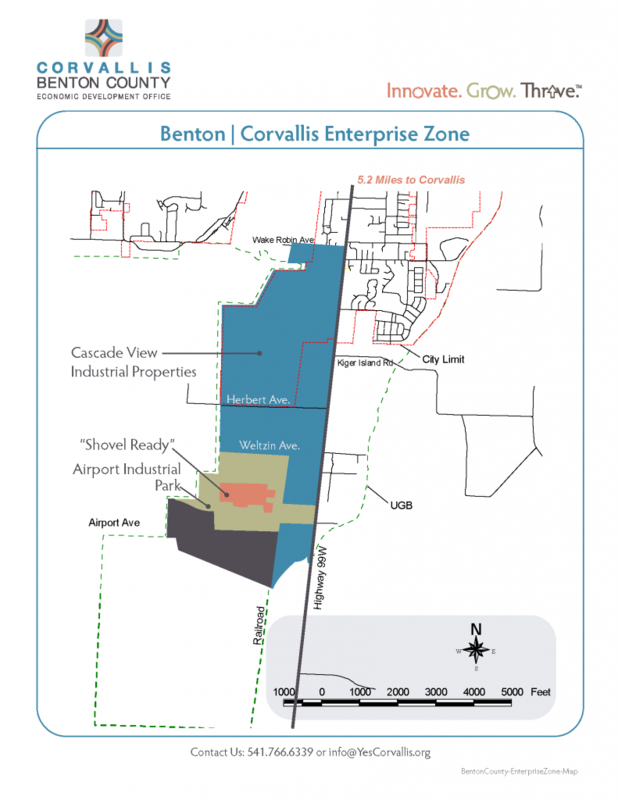 The Corvallis Airport Industrial Park is in the Benton-Corvallis Enterprise Zone , and has tax advantages for industrial and manufacturing related businesses. For more information about expanding or relocating your business to Corvallis Municipal Airport Industrial Park, or another of Corvallis’s Enterprise Zones contact us.